Grain/Texture: Grain is straight, with a fine to medium texture. High natural luster. 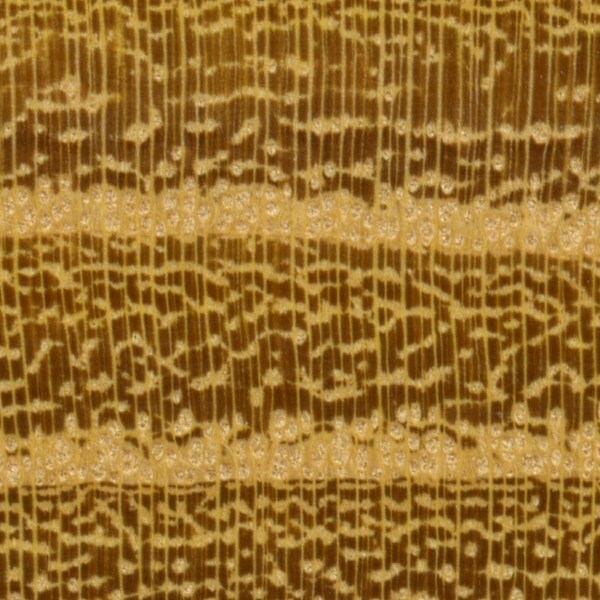 Endgrain: Ring-porous; large to very large earlywood pores 2-3 pores wide, small latewood pores in clusters and tangential bands; tyloses extremely abundant; growth rings distinct; narrow to medium rays visible without lens, spacing normal; parenchyma vasicentric, lozenge, and confluent. Rot Resistance: Osage Orange is extremely durable and is considered to be one of the most decay resistant woods in North America. 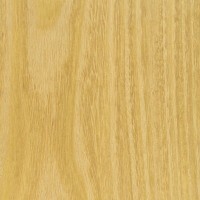 Workability: Working this Osage Orange can be difficult due to its hardness and density, though it is reported to have little dulling effect on cutting edges. It turns well, and also takes stains, glues and finishes well. 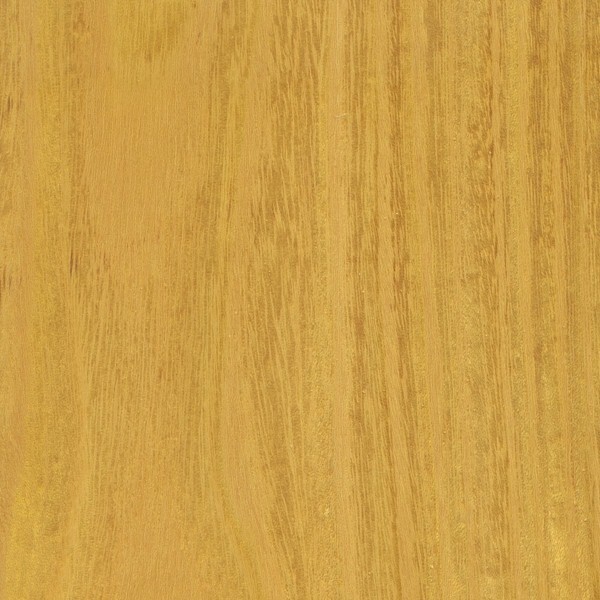 Pricing/Availability: Having typically small, crooked, and knotty trunks, Osage Orange isn’t usually harvested for lumber, but can occasionally be found for sale in either board or small turning block form. Due to its domesticity and adequate supply, the price should be moderate, though likely to be higher than most other native lumbers on account of its “specialty” status. Common Uses: Fence posts, dye, archery bows, musical instruments, turnings, and other small specialty wood items. Comments: Osage Orange has a relatively low modulus of elasticity compared to its weight and modulus of rupture which helps explain why it is sometimes used for archery bows. It’s sometimes called Bois d’arc, which literally means “bow wood” in American French.The wood is also very stable, with little seasonal/environmental movement. One helpful characteristic that can help separate it from lookalikes such as Mulberry or Black Locust (besides being heavier) is that Osage Orange contains a water-soluble yellow dye, so putting shavings into water will turn the water yellow. Osage Orange has been shown in studies to produce more BTUs when burned than any other domestic hardwood, and is accordingly sometimes used as fuelwood. Osage is my absolute favorite locally sourced, inexpensive turning wood. Fine grain is great fro ornamental turning as well. Do you still have this vase turning?? If you want to sell it, please get in touch. 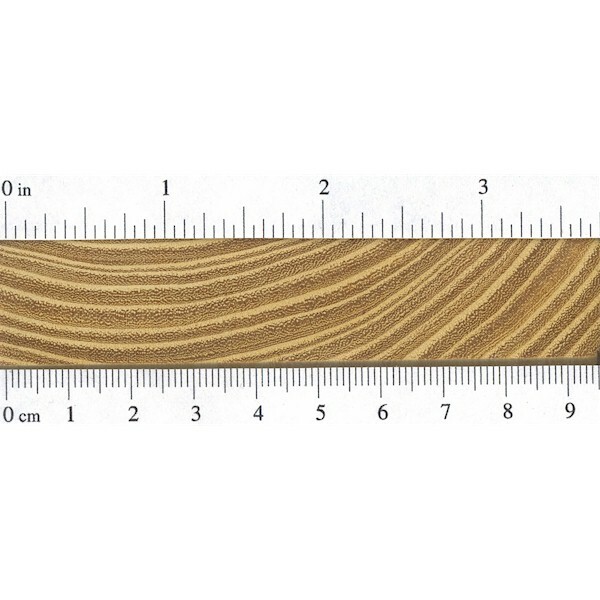 This is a “sparkling” wood. NEVER burn it in an open fireplace or even campfire. Similar to burning acorns, it will “spit” embers out which can start furniture/rug fires. There should be no combustibles within 5 or more feet of an open fire. Why is Osage Orange (or Bois D’Arc as we call them in Oklahoma), always listed on the Janka Hardness test as being tested green? It’s the only wood I’ve seen done this way. I would guess that it’s because osage isn’t a commercial species, and it hasn’t been tested as extensively as the other hardwoods here in the US. Most of the data that people get (including myself) comes from tests done by the USDA, and nearly all of the sources only have information for the green wood. For building or fencing applications it is so hard when dried, that it will not accept staples and it will bend nails, so fence with it when green and expect it to get harder as it ages. I burn boddock (osage) for heat and it burns longer and hotter than anything i’ve used. But not so good for a fireplace because it does a lot of popping. I am new to this site, but i live in an area where there are a lot of these trees. I have also heard how people put these in their basements to ward off spiders. My dog recently died of canine dysautonomia (aka disautonomia) and I think somehow it has something to do with the toxicity of these hedge apples that are all over our property. This is just a theory of course and I have no way to prove it. I know you posted the comment about your dog a few years ago but I wonder if it isn’t from mice rather than hedge balls. The mice that carry a terrible disease that can kill people just from the smell of their urine were found in the Midwest mostly. Dogs with the disease yours died of typically spend over 50% of their time outdoors and are located in the Midwest mostly. Hedge is in all of the US. I don’t want to doubt your hypothesis, just try to help give peace if you still live around these trees. bright and yellow when fresh cut. have built quite a few peaces of furniture with osage and find it good to wotk with but must caution that a moderate feed rate is needed or it will burn then you have fun sanding it out. the darkening dose not take that long and will occuse in or outside. 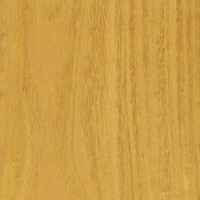 sands nice and finishes very good with lacquer. try it when you find some you may just like the wood. We sawed a couple of very green logs into lumber with a chainsaw lumber mill and had no trouble at all. Though, I would say that chain saws are in a different category. They are a law unto themselves. Once the planks were cut we ripped all “waste wood” off of the planks on a table saw. Again, we had no problems and it was easy going. I have also ripped, crosscut, and milled dried Osage and have had no trouble with power tools. 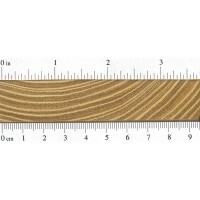 One thing though,,,,,if you linger while cutting or milling as with a router, it is very easy to burn Osage, and it is not easy to sand the burn mark out, because the depth of the burns are deeper than one would expect. We try to keep the tools sharp and don’t dawdle! 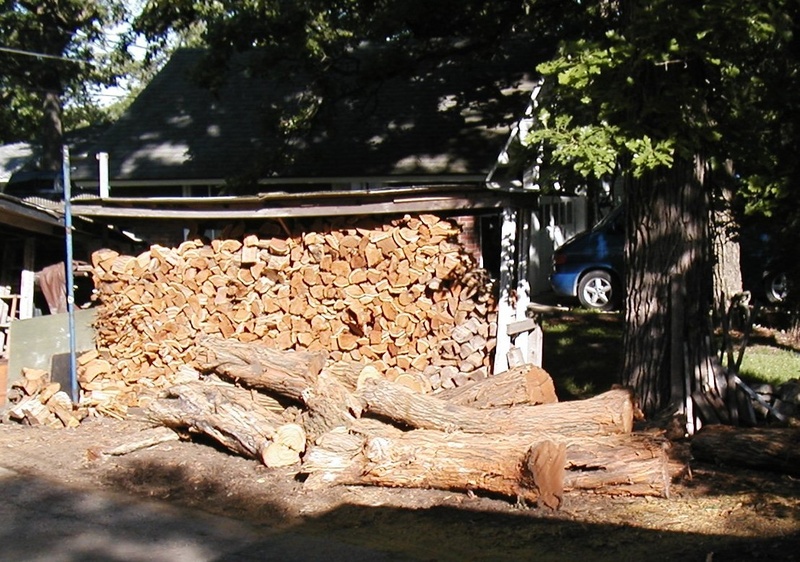 Rough cuts made when cutting lumber out of green Osage logs may actually be easier, because it is softer and more flexible when green. Whereas, when using finer finishing equipment on dried wood such as planers, routers, joiners, and working with hand tools in work such as the carving that you are doing, the going would be slower (because of the great hardness of Osage), yet easier to be accurate. There would be none of the sponginess that green wood has. Having said all of this, I have not truthfully done any carving on green wood, but am just giving you my impressions based what experience that I have had. Osage is not too hard to cut or work, cutting might be a little harder though but rasp, and sanding is a breez, I’ve been able to get glass like polishes on it. It’s one of my favorites, definitely my favorites to work. Is Osage orange easier to cut green or dried? I’m carving a sign and its taking three times as long as it normally would. I have been making rustic furniture with Osage for about 12 years. I use wood that has been dead for about 30 to 40 years. At that stage it is VERY hard. Work it green if you can. I clean the branches with a knotted wire brush with a flexible shaft and electric motor. It wears out the wire wheels. When the loose dead sapwood comes off the heartwood just starts to polish, the wheel won’t touch it. I just wanted to answer and/or comment on some things mentioned above about Osage Orange. I have worked with it as turnery, and as cabinet wood, I have also used it after air-drying it for couple of years. It does warp if the log has much reaction wood in it. Unfortunately, most of these trees contain a lot of reaction wood! (The wood grown as the tree tries to compensate for a load, as in bending loads on a branch, for example.) However, once it has dried, it is quite stable (Even some reaction wood can be acceptably stable depending on the type of use.) It does not tend to check if the ends have been well sealed, and the stack of boards are kept in the shade while they are being dried. 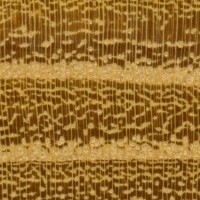 However, ring shake is often encountered, and can be hidden until the wood is in the drying process. Sparks will fly sometimes as the saw blade cuts through occasional mineral deposits. As for gluing, I have heard it said that it is problematic to glue and/or that it doesn’t take white or yellow glue well because of the oil in the wood. I have always found it to be quite dry (not oily). It takes white and yellow glue well, without any special preparation, and stays glued. For indoor use I just use Titebond or a brand like it with aliphatic resin so that it is at least water resistant (as opposed to waterproof, where I would use epoxy, or Gorilla glue for outside use). It does darken with time. Finished with clear polyurethane after about 20 years it will have darkened considerably, but at this stage the color is beautiful rich amber color and with its ample chatoyance (mainly on quartered surfaces), it’s really quite spectacular. The red streaking, which is often found in freshly cut Osage, tends to fairly quickly darken into a brown. I live near the lake in southwest Michigan and we have a good deal of Osage growing locally. It’s one of, if not the, hardest woods in the area, and my favorite to work with. My dad and I use it for all sorts of stuff. I carve a lot of tobacco pipes out of it as it’s a great hardwood for that. My dad is fond of using it on the lathe, making bowls, plates, and various thin-stemmed cups from it. The trees are rather gnarly and ugly as are the bumpy-green “oranges” that grow on them. My dad tried using them as bug and spider repellent by placing them around the house but they had no effect. 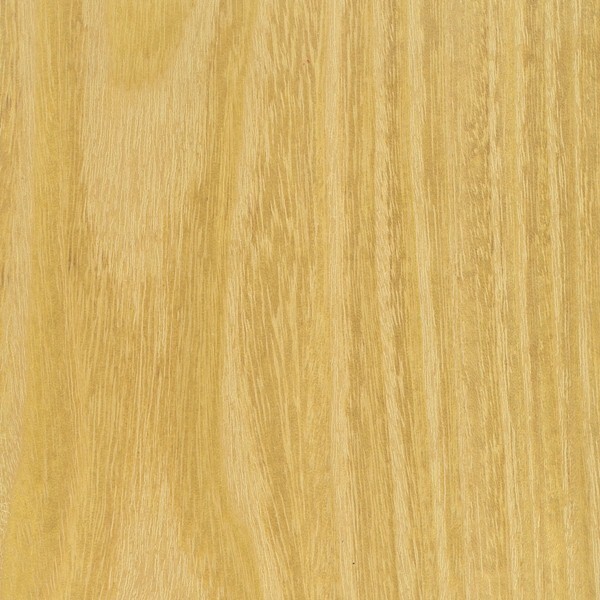 The wood is unbelievably bright and yellow when fresh cut. we live in kentucky we call the tree’s hedge apple tree’s we use the fruit that fall’s from the tree to repel spider’s and other insects from our home and garage just put the fruit on reynolds wrap the more it rot’s the better it repel’s bugs it will last about six months the spyders will be gone. 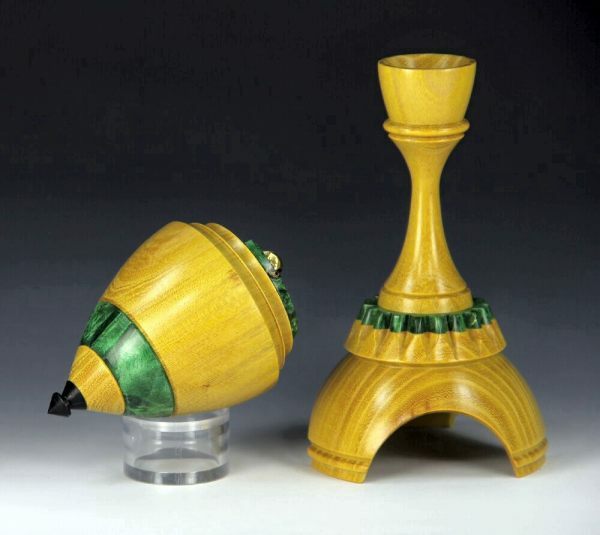 Has anyone tried making bowls and such on a wood lathe from osage orange wood? 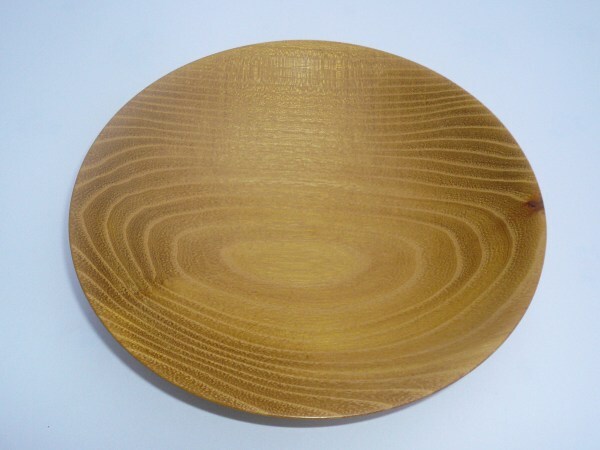 It’s such a pretty wood… I wondered about the sealing of a bowl after it’s made…does polyeurthane work or should one use like a sealing spray? My boyfriend and I are working on making spoons to start with to see how they look. It does seem like a hard wood. I wonder how rare osage orange trees have become? I have sevral very large hedge trees that i think that I am going to saw into lumber what is the best way to dry this type of lumber to keep it so that it can be used. We call them hedgeapples as the trees are commonly known as hedge trees because they were planted in rows or hedges to stop wind erosion. They grow in low twisted branches but some do grow very tall. The hedge apples are not poisonous. The squirrels eat the seeds in the middle but most animals do not like them. There are supposed to repel insects like spiders, crickets, and roaches by placing in an area. I picked a couple of the fruit from a tree that had fell from this tree which we always called Horse Apples and that they were poisonius and to not ever touch them. Why would our parents who went thru’the great depression in the 30’s tell us this and just what are they? Can anyone please tell me what the glueing properities of Osage Orange are? I can also get small to medium pieces for turning. I also have access to a limited amount of 100 +year old fence posts that have been removed. Hedge when cut green into boards tends to twist and split as it dries. The old stuff will be dark brown the green a glorious flaming yellow. I have never seen logs already dried cut into boards as you will see sparks from your saw blade when cutting it. I have worked with several exotic woods famed for their hardness and hedge is at least as hard as them esp. that raised on the high plains.